A Little Yellow and a Lot of Thanks! I'm taking a break from vacation pics this week for some outfit posts. Next week I will share the very last of them; Rome and Spain! Thanks for bearing with me. Also, I want to shout a big, BIG thank you for the kind birthday wishes yesterday!! I love you guys!! And last, on a totally separate note, are colored jeans still in? I've been seeing less and less of them in stores. It will be interesting to see how denim transitions into fall. What's your thought on colored jeans? Still in love, or over the trend? I'm hoping they are still in! But maybe just more muted/less bright colors? I've been eyeing some eggplant and army green ones! I think they are! I have been seeing jewel tones coming out for Fall! Either way, you rock them! I want a pair of coral jeans for fall to pair with plum and brown?? thoughts? I love your yellow ones and you can still rock them for the next few weeks!! I think they are still in! Your outfit is so cute. Is your hair pinned back? It's really pretty. Absolutely still in love. I plan to continue wearing them! Im wearing them all year round I love them so much! and you should too b/c they look great! you're so cute :) happy belated birthday again and i can't wait to see the pictures from the rest of your trip :) as for colored jeans - i still love them..and i thinkt hey'll be in for the rest of the summer, but patterned demin will be the thing for the fall. i'm not quite sure how much i like that yet - i'm definitely a lover of the solid colored jean trend. I definitely think colored jeans will transition over to fall but in deeper more jewel tones. I already bought myself a deep wine color! I still love them, and I was just thinking how I want a yellow pair now ... it looks wonderful with the white top!! I JUST bought jeans in this same color of yellow. So I'm going to officially declare right now that colored denim is here to stay!!! The nice thing about mustard yellow is that it's a good summer AND fall color. still love them! i intend to wear it all Fall long :) actually i intend to wear them forever even when they are no longer in because before we know it they'll be back. I love your effortless style! & the colored jeans well I'm still digging them lol! Loving your outfit!! The yellow jeans are adorable! Colored denim is still in!! I'm loving all the fall colors from Paige denim!! I hope that colored jeans are not on they're way out! I'm not a very daring person fashion-wise sometimes and waited a while before purchasing fearing that it would be a passing fad. I just bought 2 pairs from Loft a couple weeks ago. One pair in red and one pair in a deep purple-blue color. I'm still totally in love with coloured jeans! I've been seeing so many pairs in rich fall colours! I love mine...I need to bust them out before winter...is it normal to panic when you see all the summer stuff that hasnt been worn yet and fall is around the corner?? Oye!! You look so stylish from head to toe! I love your colored jeans and mine also... I hope they are still in to wear this fall! I think they're still in! But for Fall I'm thinking darker colors...mustard, wine/burgundy/rust, navy, etc. I've been hesitant to buy colored jeans for fear that they will go out. I think they will last into fall and maybe next year even, but the key is getting a more classic (red, royal blue, etc) color and less trendy spring 2012 one (mint, lavender). I think the yellow is a great choice and looks great with the white boho top and neutral accessories! Still love colored jeans, they add a different dimension to any outfit, other than a regular blue denim. I believe colored jeans are still very much in. I've seen them for the fall for the Gap and other stores. I'm still loving my red cropped pants. Love the jewelry you are wearing, especially the bracelet. I love how you accessorized your yellow pants BTW. How can you be so gorgeous everyday ?!! Yellow jeans are the best! I've never been a huge jeans person but I cannot stay away from colored pants. I love being able to add a pop of color in the dreary winter months. They are so versatile and instantly make you stand out. I jumped on the color pants wagon a few years ago, and I never want to leave! 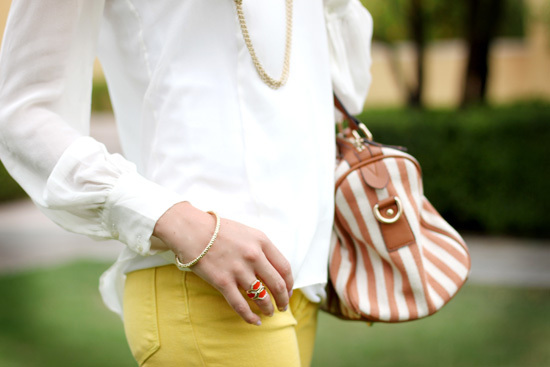 LOVE: the yellow skinny jeans, the shoes, the handbag, etc... basically I want it all. I am in love with colored jeans! I haven't purchased any personally yet, but I think it's a great way to keep your outfit casual, polished, and fun for sure! Happiest birthday, Katie!! I hope it was such a happy day for you. So still in love! I'll put my brighter ones away soon, currently looking for a nice fitting burgundy pair. But surely planning to keep the color train rolling. I think they'll be around until next spring. I guess we'll see. I still like them:) I LOVE the bright yellow pair! Such a cute look! Love your bag! Happy Birthday! You look so pretty in your yellow skinnies! The trend I'm seeing is that the pastels and bright toned denim options have begun to transition towards more richly saturated hues. I know I'm definitely still loving the look and the multiple ways to style them. Enjoy them Katie! Oh, I plan on sporting the colored denim trend for ever if at all possible. I like the fun pop it brings to a casual outfit! LOVE those great jeans! That bag is pretty amazing too. that blouse is so effortless is feminine. and that purse is perfect! Totally! I love them. I'm SUCH a jeans & tshirt girl and colored/printed jeans are the perfect way to jazz up an otherwise dull look.